Helen bought herself a new set of Frank Thomas leathers today from Mega Motorcycle Store in Bolton (Formerly George Whites). Bargain at £170 for the set. She decided to get a new set for our imminent trip to the Alps at the end of June. Her original Hein Gericke ones were purchased a while ago and she’s since lost weight so the pants in particular were very baggy, especially round the thighs and knees which mean they bunched up behind her knees and were uncomfortable on the bike. As the pants are full leather jeans there was no ventilation which made them very warm in hot weather. 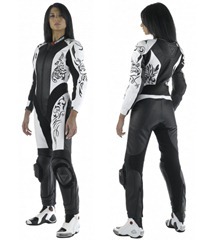 The new leathers fit well, the race-fit pants are much more flattering than her old ones and should be cooler with their fabric panels. The waist is rather on the large size when not wearing her back protector but that should mean they’re more comfortable in hot weather. The zips however are another story! We’re not quite sure whether you’re supposed to zip up both zips, but there’s a full length standard gauge zip then on the outside of that a short back zip of a wide gauge which is almost impossible to zip up as well as the long one. Potentially this shorter zip could be for fastening either piece to another part of some 2 piece leathers which has a short zip, so we’re not sure if it’s a double protection or an alternative! These are an interim measure until Helen reaches her goal weight as she’s after the Dainese Lady Tattoo leathers (they're VERY small fit and the shop informed her most women need to upsize by 1 or 2 sizes). At around £700 it’s not worth wasting money on them at this stage and will be one hell of an incentive for her to keep at goal weight! 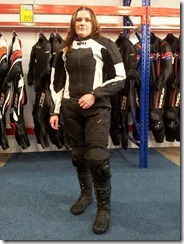 Update: The leathers have now been returned as Helen felt they were a bit too big in certain places. Although Mega Motorcycle have a no quibble return policy they weren’t for having them back. But after a little verbal exchange they did take them back in the end.